A two day National Conference on “Climate Change, Societal Consequences Mitigation :Future Vision (NCCCSCM-2018)", scheduled for 26-27 April, 2018 organized by Department of Environmental Sciences, Central University of Jammu commences today in the premises of the beautifully equipped campus of CU Jammu. This conference is sponsored by Ministry of Earth Sciences, GOI, Sulabh International, and State Bank of India. The Chief Guest of the Conference was Padmabushan Dr. Bindeshwar Pathak (Founder, Sulabh International) an international figure recognized working in the field of Sociology of Sanitation. Hon’ble Vice-Chancellor, Prof Ashok Aima, also graced the inaugural ceremony with his august presence. Other dignitaries, who graced the occasion, were IGP Jammu, Dr. S.D. Singh Jamwal, Prof. K. K. Sharma, Prof. Neel Ratan, Prof. N.K. Tripathi Dean School of Life Sciences, CU Jammu, Dr. Prashant Srivastava, (BHU), Prof. Miliap Sharma (JNU), Dr. R.P. Singh (BHU), Sh. 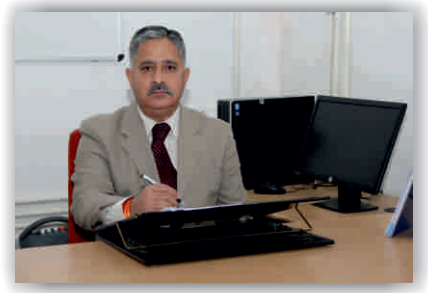 Anil Singh (Chairman, Sulabh J&K State), AGM SBI, Sh. Ajay Sharma. Chief Guest, Dr. Bindeshwar Pathak deliberated on the sociology of sanitation, best environmental practices to combat climate change in which Sulabh International is working. A Documentary on the achievements and contribution made by Sulabh International in India as well as in the world were also screened. He also laid stress on the Sulabh Jal, Biogas plant and STP plant which are working efficiently at Sulabh gram, New Delhi. These best practices are mitigating the process of climate change. In addition, Dr. Pathak encouraged the young researchers, participants and students to think out of box and find the multiple alternative solutions rather than their conventional one in the field of Environmental Sciences. He also appreciated the efforts of Organizing Committee of NCCCSCM-2018 for making this a great technical event of the Central University of Jammu and in particular of Department of Environmental Sciences. The key attraction of the Conference was the Photo Exhibition displayed in the premises of CUJ on the best clean and green environmental practices to combat climate change being adopted by Sulabh International. In his presidential address, Prof. Ashok Aima, HVC, CU Jammu emphasized that Conference of such nature provides a great opportunity for the scientific community, not only to update knowledge and keep abreast with the latest developments in the field of environmental sciences, but also an occasion for the invited speakers, delegates and participants to exchange ideas and interact with each other. He also said that this will act as channel for creating an atmosphere which will encourage and inspire students and young researchers for their overall academic growth. Prof. Deepak Pathania, Patron and HoD Environmental Sciences, CU Jammu presented the welcome address to the gathering. He also informed that about 95 participants from all over India are participating in this conference. He apprised the audience that about 12 invited talks, 20 oral and 45 posters on various topics linked to various aspects of Climate change are expected to be presented during this two day conference. Dr. Pankaj Mehta Organizing Secretary of the Conference, summarized the event and presented the vote of thanks. He expressed his sincere gratitude for financial support rendered by sponsors, He expressed his sincere thanks to Prof.Deepak, Dr. S. Dhar, Dr. Richa Kothari, Dr. Anita Singh, Dr. Dinesh Kumar, Dr. Angeelika Sharma, PG students of Department of Environmental Sciences, research scholar, Zahid Nabi and Anjali Bala for their untiring efforts and support in organizing this conference.